Don’t expect an extremely creamy texture of this ice cream. Because blueberries contains lots of water itself, I don’t know how to reduce the icy texture when using blueberry as the main ingredient, except wiping the washed blueberry drier. Re-challenged: Sept 4, 2016. The texture of the ice cream was improved A LOT, less slushy because I tried to reduce liquid contents. Still, may be I should replace maple syrup with just sugar to make it even better. Recipe below has been updated to reflect improvement. My cookie recipe searching has finally come to an end. 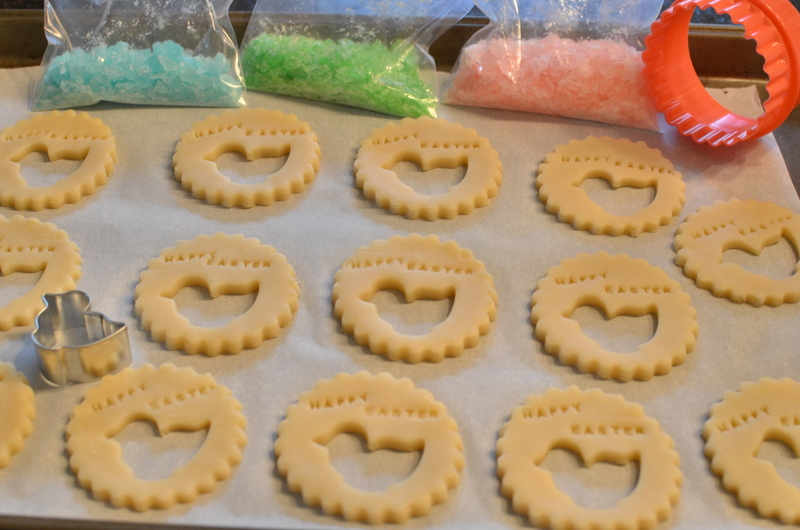 I have been trying different sugar / rolled cookie recipes so I can have a dough that I can roll out easily, and can press my alphabets onto the dough and produce reliable results without my words smear (no baking powder / baking soda allowed) / produce uneven surface after baking. Then I came across this recipe (from a baking forum) and I realized all I needed is a simple butter cookie recipe and this is it. Four ingredients only, nothing fancy but the dough is smooth and don’t need any extra flour to help roll out the dough. 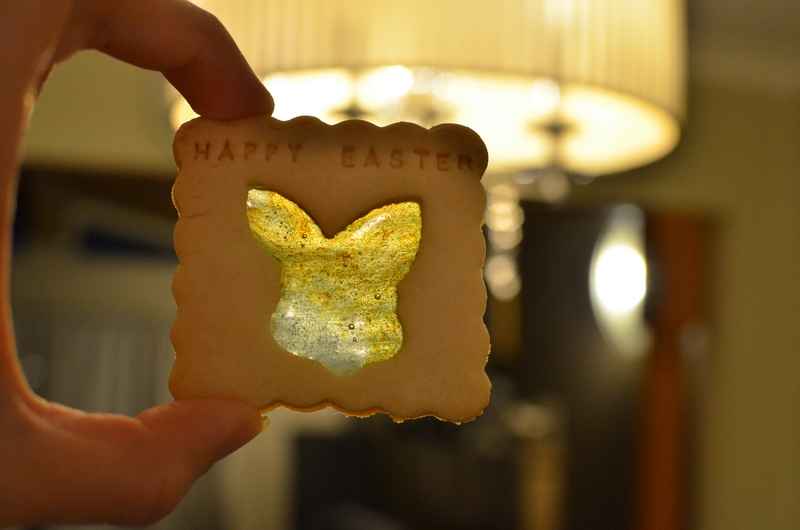 To make these cookies more exciting, I combined the glass cookie idea and added in colored hard candies for colored glass effect in these beautiful Easter cookies. Add one egg and beat until mixed. Stir in flour with a spatula and mix into a dough using hands. Flatten slightly into two discs and wrap each with a plastic wrap to chill for 30-60 mins till hard. Roll out the dough to about 4-5mm thick and cut into desired shapes. Bake at 330 degrees for 11 mins. (every oven is different, I baked mine at 350 degrees F and needed 15 mins total time). Then add crushed candies into the center and put back to bake for 4 to 5 minutes and remove from oven once you see all candies melted but before changing colors. If skip the candies, total baking time should be 13-16 depending how golden you like the cookies be. Remove from baking pan once the candy hardens and cool completely on a wire rack. Tips: May chill the cookies after shaping / pressing molds for 15-20 minutes before baking. I did both with chilling and without chilling and both yield similar results. It’s important to use parchment paper to line the baking sheets to avoid candy / cookies sticking to the sheets. The dough is excellent for any molds / stamps. Most importantly it tastes good too! This combination of pistachio and rose is common in Middle East. First bite to it reminds me of Turkish Delight, but definitely I like shortbread cookies better than the sticky super sweet Turkish Delight chews. Recipe adapted from Rachel Yau’s Seasons at Rachel’s Kitchen. I always hope to get a smooth cake top like the sponge cake guru Jeannie Tay’s cake. My cakes usually cracked at the top no matter how careful I prepared the meringue / adjusted temperature according to my naughty oven. The latest failure is a super funny one… and I baked this cake in the same week of Halloween too, make it super spooky. I made this Pokeball Log cookies last year for my son’s birthday. Then I continued to try a couple more other simple designs of log cookies using this beloved wooden box. After 1 year, my son’s favorite is still Pokemon, which means another chance for me to improve on the cookies. Last year cookies were more pink and brown, so I need color to be more bold. This year I’m adding more food coloring (sorry kids) and it’s the right color I wanted finally !! I used Dorie Greenspan’s cookie recipe this time instead.. and man.. it spreads after baking. My cookies top and bottoms all stick to each other. I won’t compensate next time by increasing baking temperature as I want 300 degrees only to maintain the color of the cookies rather than golden brown if baked at higher temperature. So next time if I’m using this same recipe, I would definitely space the cookies at least 3 cm apart !! Nevertheless, the cookies taste great and most importantly, the 6 yo kids probably didn’t notice those wrong color cookie crumbs at the border before they popped them in mouth. Here I present, the cute PokeSquare cookies (again) : COOL is the first word when my kids saw them in the kitchen. “My Name is Panda, how do you do? I love to eat honey, up in the tree. This is my daughter’s favorite song. Even though she doesn’t like to eat my bread normally, I know she cannot resist my attempted panda loaf. Nevertheless, I’m looking forward to my third attempt in near future with using a more stable loaf recipe and hopefully I get more slices of good looking panda. 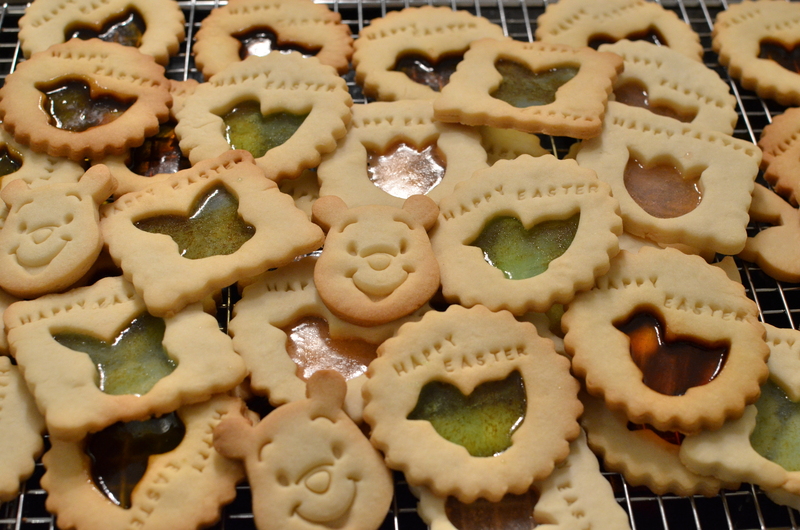 Two years ago I made Sheep German Cookies to celebrate year of Ram. So this year seeing people posting the cute chicken pictures, I have to join the fun. The recipe I saw people sharing is the same one that I used 2 years ago. So I guess base is the same, just people’s creativity gets better. I got a big slice of turkey breast to take home from the new year’s eve party. I was going to just make turkey pot pie, which is simpler with only a top crust to put over the turkey meat mixture. I always wanted to try making Hong Kong style chicken pie at home. The crust is melt-in-your-mouth type of texture and sweeter than just a traditional pie. I like it better than the western flaky pie as it’s is crunchy and crispy yet melt in the mouth. Buying it from bakery has been my only option, but I think the filling is always quite little with relatively thick crust. Making my own can control the thickness of the crust and the contents of the meat mixture (I use mushroom / edamame / corn, which is nicer than just frozen vegetable mix). More filling with thinner crust than bakery, yet there are still a good portion of crunchy, melt in your mouth crust for each pie.